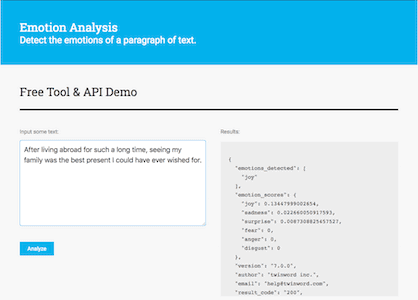 We are happy to announce the launch of our new Emotion Analysis API! 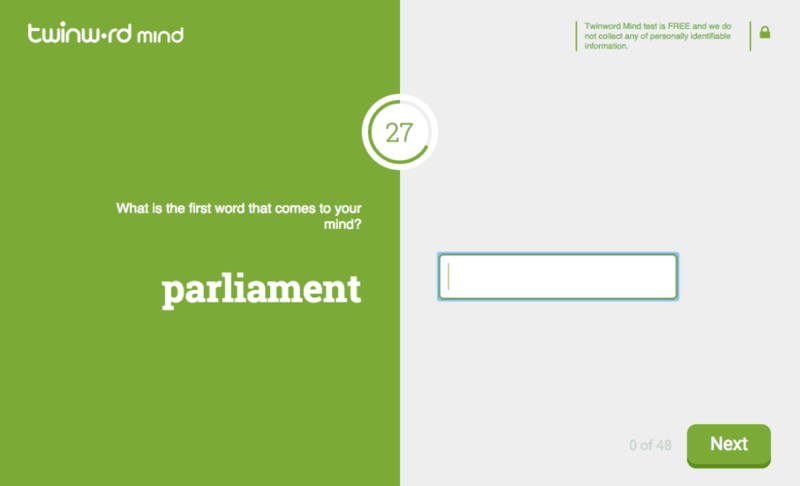 This new API enables you to detect the emotions of a paragraph of text. In total, our API can identify 6 different emotions. Those are: joy, anger, sadness, disgust, surprise, and fear. After analyzing the paragraph, our Emotion Analysis API indicates which of these 6 emotions were detected. You can see in the image below, that the API displays the strength of those emotions in form of emotion scores. As our world becomes increasingly digitalized, more and more people are interacting through digital platforms. The detection of emotions in written text is a powerful tool that can be useful in several ways. 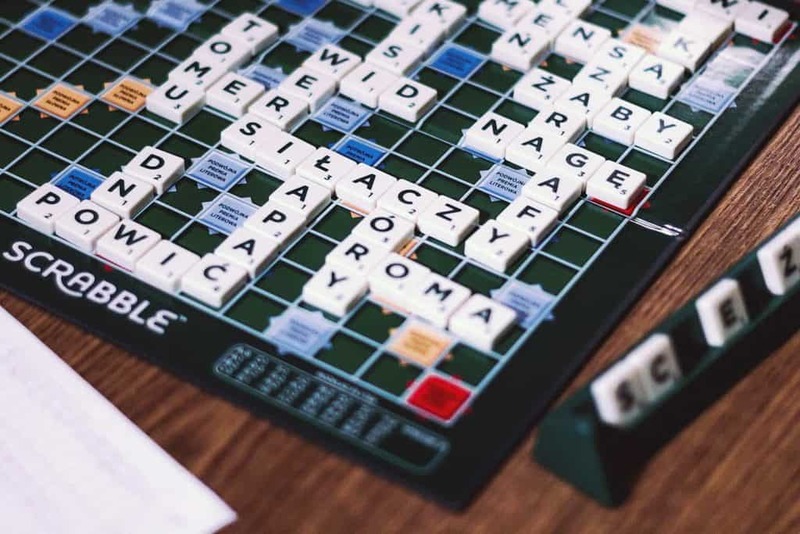 For example, by understanding the emotions of your users you can easily measure and analyze User Experience and get to know your users in a completely new way. With the help of our Emotion Analysis API you can even customize your app or website according to your user’s emotions. For example, you could use our API to implement auto-suggested or pre-filtered emojis in messenger apps. In that way, users can easily find emojis that fit the emotion of their message. Interested? 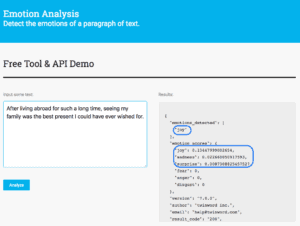 You can try this API for free at our Emotion Analysis API Demo Page. You can also consume the API directly via Amazon AWS Marketplace or Mashape API Marketplace. Find more information on how to consume our API. 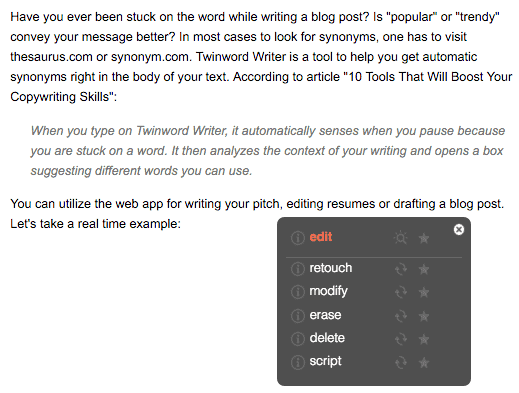 Product Marketer at Twinword, Inc.